This tool is designed to safely disassemble the components of the barrel from a cut-up or intact barrel assembly. It can also be used to assemble the parts on a new or reclaimed barrel. It is a superior replacement for plain press plates and rails that are available elsewhere and allows the thin-walled barrel components to be moved without damage. This tool is designed solely for the Romanian RPK rifle barrel and the Romanian PSL/FPK barrel and does not work with the Yugoslavian RPK barrel. Similar to the previous tool it is manufactured from 5/8″-thick x 1 1/2″ wide x 9″ long AISI 1018 cold-drawn steel that is not heat-treated. 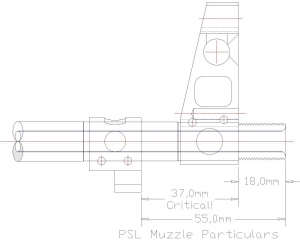 Below I posted a sketch of how a correct PSL muzzle end is assembled. The threaded section should be 18,0mm in length in order to accommodate the long flash hider of the PSL. Most critical is the distance from the muzzle side of the front sight to the front of the bayonet locking tab. Subtracting 18,0mm from 55,0mm renders 37,0mm from the muzzle side of the front sight block to the muzzle side of the bayonet lock and this distance must be held in order to use the PSL muzzle brake and lock a bayonet. The GS-0006-A, -D, -K, -L, -M is furnished with a 55,0mm (2.165″) and 18,0mm (0.709″) short tube to set these critical distances. Please note; if your PSL muzzle has a shorter threaded section length you can either lengthen the thread or set the parts so the distance of 37,0mm (1.457″) is acquired.